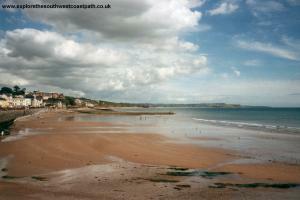 This is a short walk linking two of the most popular resort in South Devon. 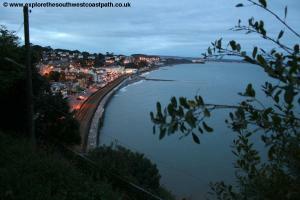 From Dawlish the path initially follows the sea wall alongside the railway and then climbs initially along minor roads and soon to the coast, offering good views around Lyme Bay. 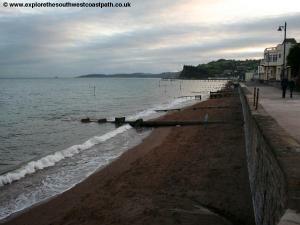 After a brief stretch alongside the busy A379 the walk re-joins the sea wall beside the railway line into Teignmouth. 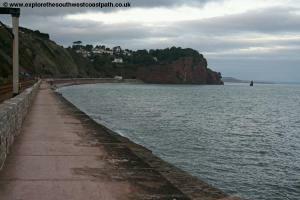 Dawlish is located on the A379 between Teignmouth and the M5 near Exeter. From the M5 exit at junction 30 onto the A379 heading west for Exeter. Take the left fork, signed for Dawlish and Starcross which soon narrows to cross the Countess Weir swing bridge over the Exe. At the roundabout beyond turn left and follow the road past Exminster and through Kenton and Starcross. The road is narrow in places, particularly through Starcross. Soon it comes to the sea east of Dawlish and you descend into Dawlish. Follow the signs for car parking, with the larger car parks being a little back from the coast. If you are returning by train, it is recommended to park in the station car park, as it is right by the coast. If you are coming by public transport Dawlish has a station with between one and two trains per hour serving it, typically to Newton Abbot, Torquay and Paignton to the west and Exeter or Exmouth (via Exeter) to the east. 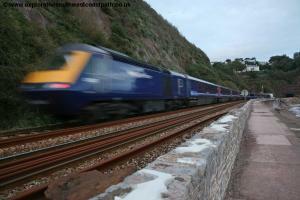 Some trains also operate to and from Plymouth and Penzance, with a few daily services to London and the Midlands. In addition Stagecoach bus service 2 runs from Exeter to Newton Abbot via Dawlish and Teignmouth 3 times per hour Monday – Saturday and hourly on Sundays. 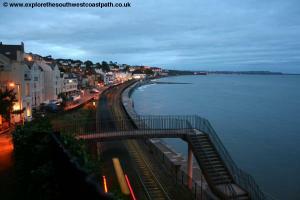 There is a good choice of accomodation in Dawlish. There is a tourist information centre in Dawlish, near Dawlish Water, which can help with accommodation. 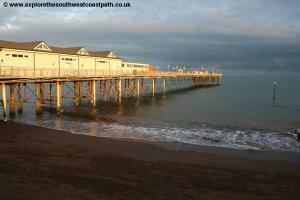 Teignmouth also has a good choice of accomodation and again has a Tourist Information centre, who will be able to help with accomodation. 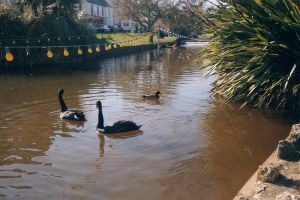 From the centre of Dawlish the stream where the famous black swans can be found flows out to the sea under a railway bridge which also provides the access to the beach. Go under this onto the sea wall beside the railway line and turn right, following the flat promenade beside the railway. This is a famous stretch of railway line, noted for itâ€™s wonderful views and occasional disruption from the sea, most notably when part of the sea wall collapsed during storms in February 2014 (it has since been repaired). 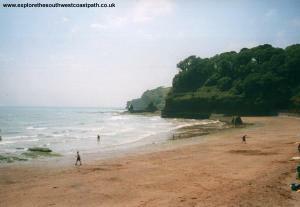 As you reach the cliffs at the south end of the beach the railway line goes through a tunnel but the coast path goes over. Here take the footbridge over the railway line and continue on the steps upwards. It is worth noting that you can get to Corytonâ€™s Cove just ahead by keeping on the lower path, but this is a dead end path that only gives access to the beach. 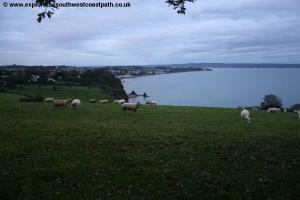 Once at the top of the cliffs take the most coastal path through the little park ahead. 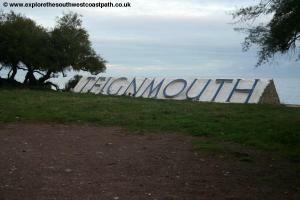 The path soon brings you out on the main road, the A379 Teignmouth Hill. As you can see the bus stop ahead, a bit before this take the path off to the left, marked with a wooden post. This heads down onto the old Teignmouth road and you follow this, a quiet residential road with little traffic now, since the main road is close by. Care is needed though because there is no pavement. Keep to the road to itâ€™s very end, when you end up right beside the A379 just to your right. Go ahead on the grass verge (which was presumably once part of the road) and after the house on the left, look out for the coast path sign to your left. Take this and follow the path between fences beside fields, which heads back to the coast. Once you reach the coast, where the railway line is ahead, turn right. Keep parallel to the railway on the path as it descends to a stream, which goes under the railway line. There is a path next to the railway line here, with a sturdy fence to keep you off the tracks. 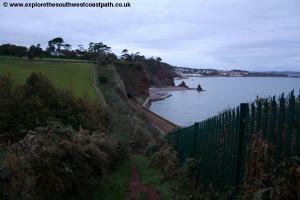 The path then climbs back up the other side back to the cliff top. The path goes through the edge of woodland here. After about 300 metres it then turns right, away from the coast on an enclosed path between hedges, with fine views of the coast. The path soon turns half left still between fences to emerge into a residential road. On reaching the road, turn right and continue ahead until you reach the main A379. Turn left along this road â€“ it is best to cross to the other side of the road first though, as the near side does not have a pavement. Immediately after a bus stop on the left hand side of the road, turn left down the road, Smugglers Lane. This is a steep road that descends back down to the coast through woodland and then emerges to a small parking area. Take the path under the railway line ahead. I have heard that this path floods at high tide on occasion however if this is the case, unfortunately you have to either wait for the tide to go out or return to the A379 and walk along this. Assuming the tide is out, once under the railway line take the steps up and then follow the good path that runs alongside the main railway line. This line carries trains down to Plymouth and Penzance ahead and to London, The Midlands and North in the other direction. You follow the path for around half a mile to reach Sprey Point, where there is a small breakwater and on the left, the famous Tedgnmouth sign, mainly for the benefit of rail passengers. 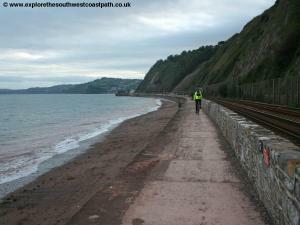 Continue on the sea wall path until the railway line turns inland, away from the coast. 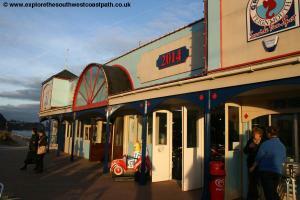 Here keep straight ahead along the promenade, passing the pier on the left. 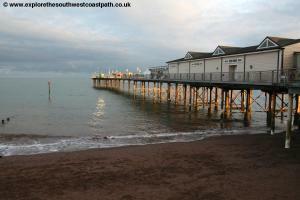 The pier was sadly badly damaged in storms in February 2014 and has only fairly recently re-opened. The walk ends here at the pier. To get back to Dawlish you can either take the train or the bus. The train is recommended, because the route is so spectacular and in places more coastal than the route you have just walked, however the bus is more frequent. There are typically one to two trains per hour between Teignmouth and Dawlish, most of which continue to Exeter or Exmouth. Most trains are operated by Great Western Railway, with a few operated by Cross Country Trains. Buses run 3 times an hour Monday – Saturday and hourly on Sunday and it is Stagecoach South West route 2. To get to the railway station from the pier, cross the road and then take the path from the pier through the middle of the gardens to the road. At the main road turn right and turn left along Triange Park, the pedestrianised road into the centre of the town. At the end is Regent Street. Take the left of the two roads ahead, Station Road (a one way street, no entry for vehicles). Continue along this and cross the main road at the end to reach the station. For the buses follow the same directions to Regent Street and then turn left, as the road becomes Wellington Street, the bus stop is by WH Smith for buses to Dawlish. Here are some photos of the walk, taking on various occasions. Click a picture for a larger version and description. Ordnance Survey Explorer 110 (Torquay & Dawlish) covers the coast between Dawlish and Teignmouth and is available in the tourist information centres in Dawlish and Teignmouth, from bookshops locally and from online retailers. The following links also show the maps of this area.